True story: when it comes to hair, we all want more of it on our heads and less on our bodies. We spend countless hours and use various ways to make ourselves smooth and fuzz-free - from shaving, to waxing, to depilating, it’s become an obsession in our society. Even men are getting in on the act these days - suffice to say most of us wouldn’t mind at all to be fuzz-free for life – especially on our legs and underarms. Once upon a time, we would try electrolysis, but that is slow, sometimes painful and definitely a time-consuming process. Thankfully, technology has improved and increased our options to bring us permanent hair removal via lasers and IPLs. Until recently, these new options are only available at salons so you would need to book an appointment get permanent hair reduction and your hair removed. 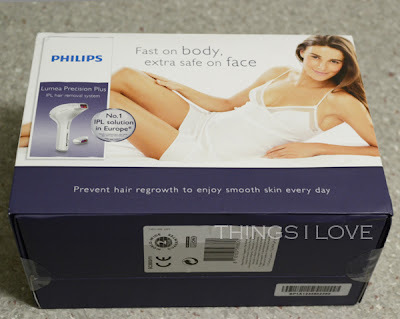 Well, now there is a new option – At home IPL hair removal with Philips Lumea IPL Hair removal system. Uses IPL (Intense Pulsed Light) technology to destroy hair at follicles and prevents regrowth. Over time the follicle will die and hair will stop growing. Variable energy intensity means its suitable for all areas of the skin from the legs to the face to the under arm and bikini. Features a flash and slide function to allow faster treatment time. Built in safety measure where IPL will flash only when correctly applied across the body. Last up to 5 years with the lamp able to generate over 10,000 flashes ((after which it's implied that it the lamps may start to fail and as it doesn’t have replaceable parts, it probably means you will have to dispose of it). Philips Lumea IPL device - shaped like a space-aged nerf gun, it is very ergonomically and comfortable in the hand, with the operating button in a convenient location and the power and settings options well positioned so that there are no accidental changes of settings during use. 2 lamp window attachments for the device, one that covers a wider surface area (4cm)and another for another smaller one (2cm) with an integrated light filter for more precise hair removal at lower intensity (so is better for sensitive area such as bikini lines and facial areas). A/C Power adaptor – the unit takes over an hour to fully charge up and gives about over 200 flashes before running low on juice again and needs to be recharged. You cannot use the device whilst it’s charging but it’s is cordless and portable when fully charged! 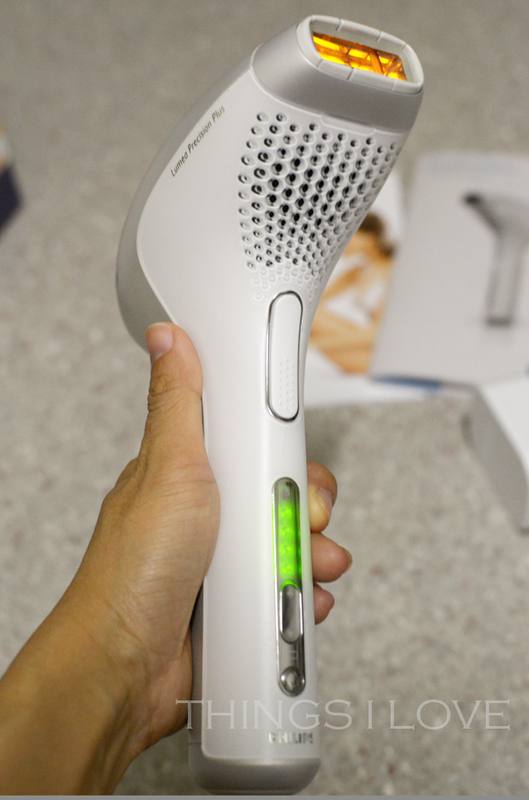 In a nutshell, it the IPL device on, position the the lamp window over the area of the skin you want to remove hair from evenly across until the ready green indicator light on the back turns on and then press the trigger to activate the IPL flash. Too easy right? There are 5 power settings on the device to customise the intensity of the light pulse for different types of skin as well as different part of the body (eg. lower setting on the facial and bikini region compared to the legs or underarms). This is very handy because it allows you to adjust for how well you can tolerate the discomfort during treatment and also means that almost every skin type can be treated with this device. 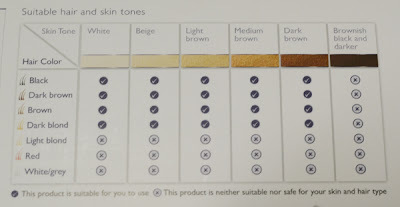 I’m fairly tolerant to pain and having epilated most of my life and having had previous laser hair removal treatments at salons, I knew I could handle the discomfort and so I started out with the highest (level 5) setting but I’d advise other beginner users to start with a low setting if you are unsure of your skin’s tolerance and crank up the settings the next treatment. 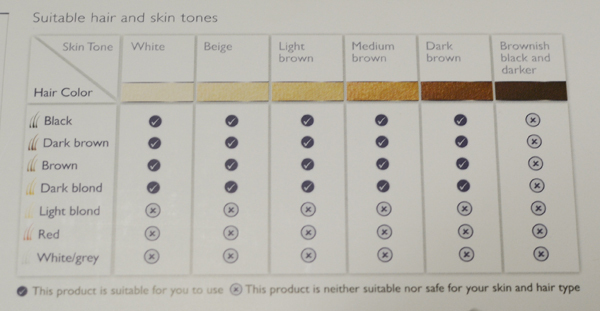 For sensitive areas like my upper lips and bikini area, I use the level 2 or 3 setting. I have fine short hair on my body, and didn’t feel the need to shave before treatment except for the bikini region where I have longer and thicker hair. I don’t shave mainly because it allows me to better see which area of skin I’ve flashed vs the area I haven’t because the hair does get singed once it’s been flashed. 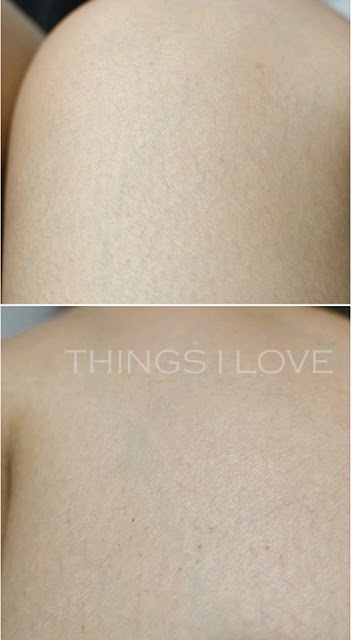 Hair before IPL flash; after - see the singed dots of hair? However, if you prefer not to smell the singe of hair or have long hair, shaving a day or 2 before treatment the preferred/better option. I trim my hair on my underarms and bikini because these grow longer and there is too much singeing otherwise during treatment. Once the area of skin is pressed evenly down against the attachment window, the green indicator light comes on and you can press the trigger to flash the skin. The device then takes about 3 seconds to recharge itself before you can flash again. How to ensure you cover all areas? On legs and large areas you can use white (make sure it’s white so it doesn't absorb the light energy) chalk to draw 3cm gridlines (so there is a slight overlap from the 4cm lamp attachment) to help you guide through the areas you will be flashing. I have tried doing this the first time but found it too time consuming and troublesome so after I got used to the product, I started treatment without drawing on my skin. Either way, you would flashed on a straight line from top to bottom (especially on legs) before moving horizontally to the adjacent area. You can use the glide feature of the the device to slide the unit along to the next area to be flashed, but because of the delay in re-flashing, I prefer to lift the unit off my skin and move it along to the next area to be flashed. This is obviously a personal preference and others will operate the unit in a way that is most comfortable to them. How much did it hurt? I didn’t find the flash on skin painful at all, it was more like an elastic band flicking against my skin and quickly dissipates afterwards although on my face and bikini area, the flicking pain was slightly more intense. I just adjust the power setting down until I’m comfortable with the discomfort before continuing the rest of the area again. 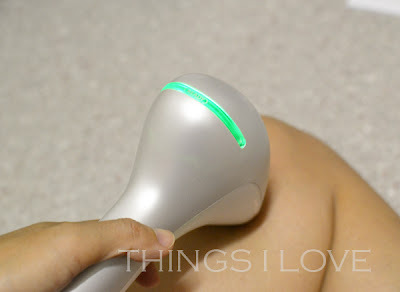 How often do you use this IPL device? I follow the recommended usage frequency and operate the device in treatment mode, using it every 2 weeks. Over time, you will find that you will have fewer re-growth and can go for longer without treatment. This is when you enter maintenance mode. In this period you only need to flash every 6-8 weeks depending on the speed of your regrowth. Let me make no bones about this – this at-home device is never going to be as powerful as the machines used in salons. Therefore the results should never be compared vis-a-vis, on treatment-for-treatment, hair-for-hair loss basis - it just wouldn't stack up and and neither would it be fair. What you can expect though from my experience, is that hair will begins to shed from the body 5-6 days after treatment. Coarser hair (which absorbs more of the light’s output) seems to shed more than the fine hair (which contains less melanin and therefore absorbs less light). As hair grows in different cycle during each treatment, not all hair would shed after each treatment and you can be left with patchy areas of hair after a week’s time. Shaving (required very infrequently) in between treatments ensures even fuzz-freeness during the interim treatment periods. For my hair type, it seems to take between 4-6 treatments (about 2 to 3 months), before the hair dies and stops growing back. The hairs that do grow back are softer and finer (even in the bikini region) and also the hair regrowth is slowed down significantly after 3 treatments. Obviously this depends on the hair cycle and how strong the hair follicle is so the hair regrowth time frame vary on different parts of the body. Using this device definitely take longer to remove hair than going to salons where the machines are more powerful and so takes fewer treatment to get the same results. But this also a lot less painful/uncomfortable given its lower power output and is effortless to use. This IPL device has an advertised life span of 5 years so you will get plenty of time to continually use the product until all your unwanted hair is removed from your body. It is easier and more convenient since you can do it any time you have a free moment to treat yourself (or get someone to treat you for the hard to reach areas such as your back). It will also allow you to use it as a maintenance product (every 6-8 weeks) once you’ve remove most of your hair since you will always have it at home to remove any stubborn regrowth that crops up over time. Overall I’m extremely pleased with the results and I feel this investment device (it's damn expensive with a suggested retail price of A$1299) pays for itself in the long run. I’ve honestly paid a lot more over the last 2 years to have my body treated of unwanted hair in salons and I’m still nowhere near hair-free. I’m just glad to have this device to finish off the job that was started off in the salons. RRP A$1299.95 at all Shaver Shop nationally. If you can’t afford this new model, I'd wait for it to go on sale or pick up its predecessor - model SC2001 (which is less flashy literally with fewer flashes per charge and covers a smaller area per flash) which is currently on sale at the Shaver Shop stores for A$599. Wow! this product sounds amazing, but it's so expensive :( I'm getting laser done at the moment and I paid about $144 for 8 arm pit treatments.. I've got 2 more treatments left and most of the hair has stopped growing, a few falling out. I haven't shaved in months. I might just stick with that lol. 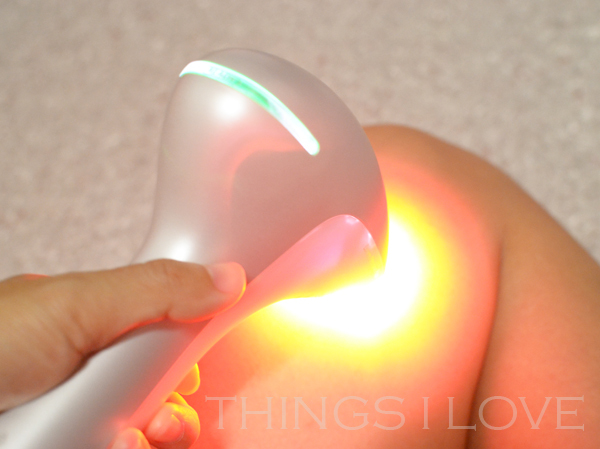 I am also using the Lumea Precision Plus and LOVE it. Like you I have had laser hair removal done (on the bikini line and top lip) and wouldn't consider going back to the salon now I have this device. My boss has been using my unit aswell and her results have been equally as good. It is quite expensive but not when you consider how much professional hair removal is. Great post, and great review. I am lucky as my cousin works in a beauty salon, so I get lots of free treatents. I must say I prefer to wax, but defo wouldn't rule out permanent hair removal. Fantastic review! I was offered the chance to trial this product but I decided it probably wasn't for me, as I haven't ever tried laser hair removal before! I also wasn't sure if I was patient enough to use it regularly. How long does it take to do, say, your legs? To answer Nalini's question I do 3/4 of each leg and find it takes me 1/2 an hour. Not bad when you can do it in front of the TV! @Lily - that's a pretty good deal. It's the legs that costs the most. @Kate - I know right, especially, when I can access the device anytime I need. No need to try and fit in the appointment during lunch times or ducking off work early! Thanks Nalini - not sure it would suit your skintone, but if it did, I'm sure if you can stand a rubber band flicking against your skin, you would be fine with using this device.